My Little Pony Arena » Forums » Pony Talk » Off Topic » Can any one help me identify this critter? 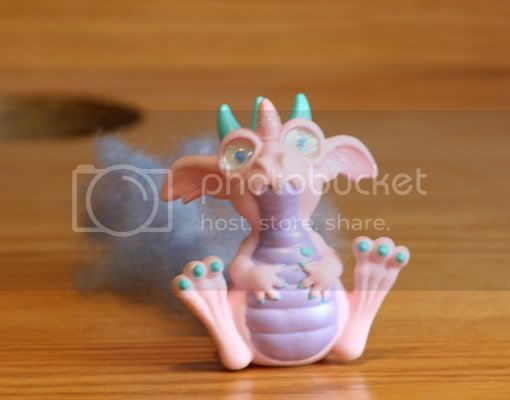 Forums » Pony Talk » Off Topic » Can any one help me identify this critter? Can any one help me identify this critter? Posted: 0 Post subject: Can any one help me identify this critter? This was picked up at a garage sale for me, since my friend knew I liked MLP and it looks simmilar. Would any one happen to know what this is and where I could possibly find more information on it? Posted: 0 Post subject: Re: Can any one help me identify this critter? Oh those are just so cute!! !, I know I have seen one just like that and in fact I have one very similar floating somewhere in the house , but I do not know what are their names. Thanks, Hikaru for my siggie!! Thanks melskunk for my blinkie!!! That has got to be one of the most adorable little toys I've ever seen! I'm definately going to be watching this post to see if anyone has anymore information. Does he/she/it have any markings anywhere that might identify the maker? On the bottem, it says Copyright MBT 1990 but thats it. I'm not exsactly sure what MBT stands for though. hmm, i cant think of a toy company called mbt unless they went out of business. unless its a tv show abbreviated? You are the memory that lives on forever, the shadow that stands by our side. It might have gone out of buiness, who knows. scary thing! 1990... hm... i have no idea either search for mbt at least. I searched for MBT and came up with Mark Bergin Toys. Hrrm it doesn't look familiar at all to me. could stand for milton bradley toys maybe? I've never seen it before but it sure is cute! Thats what I tought at first as well, but I didn't find a thing on serches. Milton Bradley does Dragon Tales, not sure if it was around in 1990 though...might be something related to that?